Equestrian Movement - Is Your Horse Fitter Than You? Log In Home Who Are We? Is Your Horse Fitter Than You? One of the common issues I see as a horse riding instructor is that my students horses are stronger, fitter and more powerful than they are. Well, let's truly be honest, when you are working with 500kg plus animals, they are more than likely going to at least be stronger and more powerful than you, if not fitter. Even if it is a 300kg animal you don't really want them to know how much stronger than you they are. I laugh when people talk about dogs being too strong for them to handle, which are at their heaviest 50 - 100kg, but which is still obviously a significant weight. The key is not to be bigger or stronger, nor bully them into submission, but to create a channel of self expression through disciplined behaviour. Set parameters and boundaries in what you see as acceptable behaviour, follow through with consistency, and allow them to express their individuality constructively. This establishes you as the leader they want to follow and can trust instead of the dictator that they must follow or will suffer. One of the first goals I go about with a new student is to break down the power struggle and try to find a level of cooperation between horse and rider. I find a battle of the strongest is rarely successful because it has never worked for me let alone my students. The easiest way for establishing a good working relationship is setting some boundaries and expectations. I choose to do this in a non threatening and easy to apply way. It needs to be consistent with each and every time you are handling your horse. It also needs to be done with compassion. The idea of bullying a horse into submission is dated, we don't need that for submission - in fact it works against us for true submission. Clear, well established boundaries are all that is needed. A horses behaviour is an expression of their personality interacting with their environment. How a horse reacts to an environmental stimulus is firstly defined by its' personality and secondly how it has been conditioned to react to stimulus. You can help set a standard for how you want your horse to work with you but you cannot 'make them behave'. This is a tricky one. You don't develop a relationship with a horse in a day, or a week, or a month. You establish it over a lifetime. Every interaction positive or negative is affecting your relationship with your horse. How you react in difficult and stressful situations teaches your horse whether or not they can trust and rely on you. How you guide your horse through difficult times is the crux of your relationship with your horse. This is where having clear, established boundaries really come into their own. If you have established your expectations in a non-stressful, relaxed environment, followed through on these expectations to the reward, you can quickly and easily define your expectations in a stressful and over stimulated environment, channel the excess energy into focused energy and positively work through the situation. This then also reinforces your good leadership skills and the horses' trust in you to make good decisions for their well being. You can actively take control of a situation that makes your horse uncomfortable and navigate them through to a positive resolution. Each time you can do this you are strengthening your relationship and your horses trust in you, your trust in your horse and your confidence in yourself to work through difficult situations with your horse. What is your why? This is an important part of your relationship with your horse. If your why is at the detriment of the mental, physical or emotional health of your horse you are breaking their trust in you and breaking down your relationship. However if you are providing just the right amount of mental and physical stimulation to make them feel confident and good in themselves they will willing work with you in the development of their training. Take the time to define why you are dedicating countless hours of work, training and money towards your riding. If your why is to get recognition or get a ribbon at a certain competition, this can mean that you compromise your horses physical, mental or emotional well-being and they will know what you are doing is not in their best interest. If you can confidently say your horses mental, emotional and physical well being is your primary objective the rest will come. Your horse will feel good for the mental and physical stimulation and will actively engage in their training with you. Best case scenario they will also look after you and teach you - if you are willing to listen and learn. Sometimes in training we are aimlessly shooting for the stars without a strategy of how to get there. It is important to dream big but your goals get a lot harder to achieve without a solid strategy. Define the first thing you can do to work towards the big goal today and do it! Do it until it is a normal part of your routine. "Its just what I do." Work on that goal for 3 months until it is properly integrated into your routine and don't compromise this small goal more twice in a row. You will also be experiencing an ebb and flow between your horse being one step ahead of you and you being one step ahead of your horse. Keep working on improving your skill set. Understand the foundations and continue to revisit. Ride anything and everything you can. You have to be able to balance and move independent of your horse if you want to be a competent rider with a sticky seat. I have memories of YEARS worth of lessons with my instructors trying to teach me how to influence my horses movement with my seat and I just remember thinking this is impossible, there is no way I can do that and so relied on control of the horse with reins instead of creating an integration of movement through a cohesion of our bodies working together. The thing I eventually learnt is that you had to let go of control to gain control. Trying to control the horses by griping and tensing is simply ineffective when you are trying to dance. Secondly I had to teach my body to be more sensitive to the subtleties of my horses movement. If I could only feel big shifts and evasions and imbalances then I would only be able to counter-correct movement. When I learnt to pay attention to each stride and each flex of a muscle I learnt how to get control of my seat and work with the horse with my seat. Don't lunge your horse 3 times a week if you are unfit and don't have the time to ride. You are only making your horse fitter and stronger than you are. 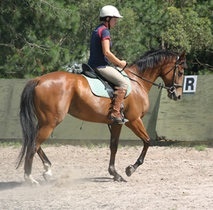 It is better for your horse to be unfit and out of work than to try and keep them fit and not yourself. Optimally it would be great if you could both be fit together that would be ideal but life happens and that means sometimes we have to negotiate on a few things. The first to go is generally our self care. Equestrian Movement is passionate about self care and optimal health and believe it is pivotal to being an effective horse rider. We are athletes and you need to treat yourself as such.